On November 9, 1989, East German officials opened the Berlin Wall which allowed people to travel from East Berlin to West Berlin. This was one of the important events beginning the end of the Cold War. This action by East Germany was preceded a few weeks earlier when Hungary opened the border between Hungary and Austria. The day after this announcement, Germans, probably on both sides of the wall, began to reduce this symbol of tyranny into a pile of rubble. I grew up knowing about this wall and what it meant. In the final days of World War II, the Americans came into the small German town where my mother and grandmother lived. American soldiers were billeted into the homes of the Germans and my grandmother took in six or eight of the soldiers. My mother spoke fluent German which helped them manage the situation but it was my tiny grandmother who, in strict German, lined them all up and made them wash before allowing them to settle into her home. Although the German people were happy to have an end to the bombing and war, it was a tentative peace as rumors flew that their little country was going to be divided up like spoils of war and word had it the Russians would be taking over the Eastern part of Germany. My mother, being able to speak both German and English, had been an invaluable help to the American military so she, being a good listener, knew it was just a matter of time before the Americans would withdraw. Every day, she would run down to the main square to see what flag was flying and the morning she saw the American flag coming down and the Russian one going up, she realized her world was changing once again. One of the soldiers she had been helping with translations confided in her that if she came down to the train station with basically the clothing she was wearing, he and the others that had lived with them the last few weeks, would see that she got out of what was to become East Germany. My mother went home and her mother helped her pack a very small handbag and they went down, like everyone else, to see off the Americans at the train. As they stood there, two soldiers appeared on either side of my mother and just whispered, “Keep walking!” and they successfully got her hidden in the ‘mess tent’ compartment of the train. They put her into oversized Army fatigues, a hat on her head, and told her to put her hands in the pockets to hide the fact she was a female and pretend to sleep. Naturally, military police went through the train cars and when she didn’t move, one of the other soldiers laughed and said, “Too much celebration last night, officer.” and they went on without further investigation. The reason my mother wanted to leave and her mother insisted that she leave was they realized how things would probably turn out with the Russians in charge. History proved that out. And, as we all know from said history, the wall went up and the gates closed and everyone there when they closed, stayed there, including my grandmother. Later on, my grandmother made friends with a priest who had been in East Germany helping with parishes when the wall went up. He was not allowed to leave. His family was living in West Germany. 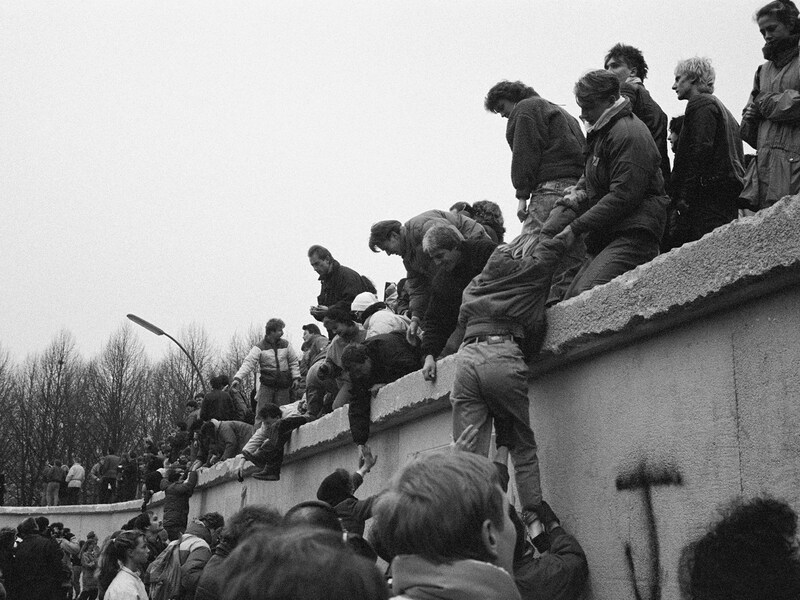 The ‘rule’ was that anyone under 65 had to remain behind the wall. However, once someone turned 65, they could leave for a visit for two weeks exactly or forfeit their pension. We only saw my grandmother once in our lives. My mother went back to visit Germany and my grandmother used her two weeks to visit and stay with the family of the young priest friend who also made me and my mother welcome there for the visit. My mother, by some twist of fate, was in Germany when the wall came down. She decided that she didn’t need to see what kept her family apart all those years. She didn’t travel to join the celebrations. She’d seen and lived enough of that already. My grandfather’s family lived in East Germany so when the wall came down, a great many relatives were reunited with the fortunate ones that had gotten out in time many years before. My cousin’s parents left East Germany when people were still allowed to go back and forth a bit. They left with my cousin in her stroller and that was about all. Initially, the Russians at the border wanted to keep my cousin to guarantee her parents’ return but they relented when they saw they were not trying to take anything other than themselves and the baby over the border presumably for a day excursion. Events in the world leave the decedents with a stronger bit of history in their make up. For instance, I know for a fact that there is no Jewish blood in my mother’s side of the family because at the onset of the Hitler regime, it was mandatory that every person have their family legally traced back two or three generations in order to include this in their paperwork. From an early age, I read all I could find on Ann Frank and related topics. I often wondered why as did most reasonable people. The Cold War deprived me of a relationship with my grandmother and a lot of relatives as they were ‘kept out of reach’ behind the closed border. It often makes me ponder how many other people were caught in the trap of the Wall when it went up and hope they eventually found their way home to their families. Ancient history? Perhaps, but looking at the situation in the world today and the problems going on, I don’t think we are too far from even more horrendous situations we will have to contend with and wonder what traces of history will affect our children?